Sir Thomas Browne: The QI of His Day? He is credited with coining dozens of new words which are still in common use. He died on his birthday. Some of his writing was first published without his permission. His works, when first published in the seventeenth century, proved hugely successful and influential. This description could easily fit William Shakespeare, but it also fits a relatively unsung hero of literature, Sir Thomas Browne. It has become fashionable to debunk myths and examine widely held truths more closely in recent years, as witnessed by the success of the BBC television series QI (and its numerous tie-in books which have hit the Amazon bestseller lists), the Sky programme Mythbusters, and the books of Bill Bryson, to name just three of the most popular modern examples. Here at Interesting Literature, too, we’re not averse to debunking a myth or two, or of re-examining some of our literary misconceptions. But such a pursuit is nothing new. A seventeenth-century man was doing it, and an eager public was reading about it, over 350 years ago. 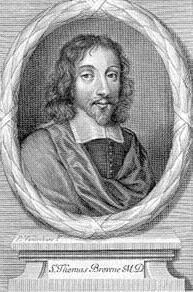 The man in question was Sir Thomas Browne (1605-82), who, fittingly, provides us with the first printed use of the word ‘misconception’. Browne first came to our attention as a prolific coiner of words, and although we cannot be sure he was the very first person to derive or invent all of the following, the Oxford English Dictionary credits him with the first recorded use of numerous words now in regular or everyday use, including (and these are only the most familiar ones): additionally, ambidextrous, antediluvian, approximate, biped, bisect, botanical, capillary, carnivorous, coexistence, coma, compensate, complicated, continuum, convulse, cryptography, cylindrical, cynicism, depreciate, discrimination, disruption, dissemination, electricity, elevator, executive, factitious, ferocious, follicle, gypsum, hallucination, illustrative, inactivity, incisor, indigenous, insecurity, invariably, locomotion, praying mantis, medical, narwhal, non-existence, ossuary, parturition, patois, perspire, prairie, precipitous, precocious, prefix, presumably, protrusion, secretion, selection, subsidence, temperamental, transferable, transgressive, and ulterior. He also provides one of the earliest uses of the word ‘computer’ (though not, as has sometimes been claimed, the very first). Browne was born in Cheapside in London in 1605 (his birthday, October 19, would also be the day on which he would die, 77 years later). During the English Civil War, he was working as a doctor in Norwich, which was a Parliamentary city but Browne himself remained a royalist (in one of the most famous portraits of him, he bears more than a passing resemblance to the king, Charles I). He wrote on a range of topics, including religion (his Religio Medici, or ‘the religion of a doctor’, proved hugely successful when it appeared in the 1640s), urn-burial (on which he wrote a famous treatise), and various topics pertaining to the natural world. It was this last subject which he took as the theme of his most ambitious work, Pseudodoxia Epidemica, which was published in 1646, although it was so popular it went through many more editions during Browne’s lifetime. The full title of this book is Pseudodoxia Epidemica or Enquiries into very many received tenets and commonly presumed truths, although it is sometimes known simply as Vulgar Errors. Its purpose was to examine the widely held superstitions and beliefs of the time, and to correct those which were false. In order to do this, and in the empirical spirit popularised by Sir Francis Bacon earlier in the century, Browne conducted his own experiments wherever possible. For instance, in order to determine whether, as contemporary wisdom had it, spiders and toads repelled each other, he placed several spiders into a glass container with a toad. The result? The spiders walked over the toad’s body, and the toad, in turn, ate the spiders. Among the other errors of the day which he refuted were the belief that elephants had four knees, that crystal was merely very hard ice, and that if you rub a magnet with garlic you remove some of its magnetic power. Browne challenges and corrects these beliefs with wit and humour, writing in ornate but accessible prose. This is a seventeenth-century version of QI‘s ‘General Ignorance’, Mythbusters, and all of the other books and television shows which delight in curiosity, questioning widely held assumptions, and examining common beliefs and urban legends. He encourages us to take a closer look, and not just accept things at face value. Browne was a one-man debunking machine. There is a statue of Browne in Norwich city centre. It shows him sitting down, holding a broken urn – a reference to his treatise on urn-burial. His writing is odd, dense, very quirky- full of really strange ideas. There he qualifies as A Good Egg. Well said – a Good Egg he is! The great journalist H.L. Mencken coined words as well. “Bible Belt’ and “Booboisie” are two that are still used today. What a fascinating person. I would imagine “extradictionary” might refer to the intuitive or sixth sense about something, whether true/valid or not–beyond words, beyond reasoning. . .
Good call on ‘extradictionary’ – I think ‘sixth sense’ is about right. Though given that we apparently have more than five senses (according, fittingly, to QI), maybe I’ll use ‘extradictionary quality’ in place of ‘sixth sense’ from now on, in homage to Browne! I do like the word. ‘What song the sirens sang, or what name Achilles assumed when he hid himself among women, though puzzling questions, are not beyond all conjecture’ (from Urn Burial) has always struck me as among the most elegant of English sentences; but as to elephants, surely they have their share of knees like the rest of us, but are unique in being able to kneel on their hind legs and their front, which leads some to assert that they have four knees? Is that, perhaps, the error that Browne refutes? I can’t believe I forgot that beautiful quotation was from Thomas Browne – I would have included it in the post. Thanks for reminding me of it. I may have to tweet it over the next few days, if I can reduce it (without drastic editing) to 140 characters! Good point about the elephants: I think you’re right. I’ll look into it, but I think he probably showed that elephants’ front ‘knees’ are actually elbows, so they only have two knees (like us, as you say) rather than four, as is sometimes claimed. Thanks for flagging this up: will amend. Thanks. I am glad to know more about my namesake. All the more he was more a doubting thomas who busted some popularly held beliefs in his time..
‘Doubting Thomas’ – that would have been a much better name for this blog post! If I ever reprint it on my Huffington Post blog, I may have to borrow that idea! Thanks for sharing this. I knew nothing about Sir Thomas Browne and all the words he created! Often misunderstood yet increasingly admired. Not a bad review at all of the most vigorous of 17th c. neologists, many of which reflect Browne’s scientific/medical interests such as ‘electricity’ and ‘hallucination’. Every work of his differs in genre, often advancing an entirely new genre, such as the encyclopedia, the psychological confessional and conceptual essay. My own 1658 edition of ‘Pseudodoxia’ includes an index with the entry, ‘Candle, one discharged out of a Musket through an inch board’ which reveals Browne’s essentially Baconian quest in his ‘elaboratory’. In ‘Pseudodoxia’ he ‘challenges and corrects these beliefs with wit and humour, writing in ornate but accessible prose’, is a nice and succinct, accurate assessment. So much of his densely-packed prose is fun to explore and blog on. Sorry for the very late response also and thanks for the invitation. 17 years study on Browne and 84 blog posts in the last 4 years which either mention or focus specifically on the learned doctor so far, mostly from an esoteric perspective. I’ve come to the conclusion that Browne is very much an ‘Everyman figure’ in intellectual history and people invariably ‘discover’ in him something new about the subject which already preoccupies them !